The initial idea for this endeavour came to me in September last year, when I was talking to my one-time colleague, and now elephant researcher in his own right, Ashoka Rajeeva, about elephants and the Uda Walawe park (one of our favourite topics! ). Ashoka mentioned in passing, that we had not sighted ‘Walawe Raja’ that year (2010). Now, for those who yet may not be aware, “Walawe Raja” is a majestic tusker in the prime of his life, who frequents the Uda Walawe National Park (UWNP) usually during the drought period, (July to October each year), when he appears suddenly to spend about 2-3 months in the park. Often he is in musth, and spends his time searching out receptive females in herds. No one really knows where he disappears to the rest of the time. Over the years, one of his tusks had been damaged, and he is thus now easily identifiable. He was the star of a film shot for the BBC/Discovery by Mike Birkhead and Toby Sinclair in early 2000, titled ‘The Last Tusker’. Raja’s popularity had grown over the years. His majesty is not only due to his physique (although he is heavily built, he carries many scars and bullet wounds), nor his tusks (which are reasonably big, but with one broken one now, does not beat any records) – unlike the late and great Parakrama-the Siyabalanduwa tusker ( who had the most perfect physique, and beautiful long tusks) who met with an untimely death recently. Raja is majestic because of his regal demeanour. He was the ‘King of Uda Walawe’ and he clearly knew it, and behaved as such. There are hardly any reports of any altercations with him and visitors on record. He considered visitors and their jeeps unworthy of his time, and often cast only a disdainful glance at the ‘intruders’. Hence it was worrying that he had not made his appearance in 2010. Inquiries from UWNP and DWLC officials, and trackers also elicited the same concern. So my son Dimitri and I decided that ‘someone needed to do something’ about this. We began the ‘Find Raja’ project knowing we were taking on an almost impossible task, much like looking for a needle (albeit a very large one in the shape of Raja ) in a haystack, not really knowing what the elephant’s normal home range was. The area north-east/ north -west of the UWNP is surrounded by village hamlets and dense forests. It is presumed that Raja’s home range extends to this area because he is always sighted for the first time during his periodic visits, in this area, which leads many to believe that he uses these ‘corridors’ to move in and out of the park. Research has indicated that home ranges for Sri Lankan male elephants can be in the order of 100-200 sq km ( Fernando. P; Wickramanayake.E ; et al 2007). However, it must be borne in mind that home range fidelity is dependent on varied factors such weather, food resources, and most importantly in this case, sexual condition. ( Raja is a fully grown male in the prime of his life and regularly comes into musth). Hence there is a fair amount of ‘guest-imation’ in deciding on the study area. The plan was to traverse the outer boundary of the north-east/north and north-western park, and talk to as many villagers as possible, showing them photo identity kits of Raja to see if there were recent sightings. They were also given a card (M/s Mercury Print from Ratmalana printed them free) with our hotline so that they could ring up if they had any sightings. Thanks to some generous donors, I set up a small team at Uda Walawe. A young undergraduate from the area Udaya Sameera, and my old friend who worked with me earlier Kapila, formed the core field team, with Ashoka and Dimitri providing additional expertise. Nishantha, from Grizzly Safaris Uda Walawe, provided the transport, with his trusty World War 11 vintage jeep, which could take on many a terrain that the more modern 4- wheel drives would ‘fear to tread’. Hans Wijayasuriya, CEO of Dialog offered to help with the IT and connectivity from base camp, which was most welcome, and we were ready to roll in November. To undertake a quick search and investigation in the surrounding regions of the north eastern and north western side of UWNP, to try and ascertain whether there have been any recent sightings of Raja, and thereby try to locate him. The progress of the work to be publicized and highlighted on an on-going basis. In doing so we hoped that more focus and attention will be on the plight of wild elephants in Sri Lanka and the urgent need to take some cohesive action immediately to halt their deaths in the wild. As it is, at the closure of the project in end December, we had not found Raja. While I am sad and possibly fear the worst for Raja, I am still happy that I was able to achieve the second objective to a great extent. With the Sunday Times supporting the project and running a column each Sunday, it generated much interest among the public in general. Dimitri’s IT knowledge was utilized to set up our blog (http://findraja.srilankaelephant.com) and related facebook group which surpassed all our expectations. It was my first ever experience with ‘blogging’ and updating a facebook group, and I was simply astonished at the power of these social networking mechanisms. We have a list of ardent followers, and today, the site seems to have grown and expanded in its scope, and is now a central ‘gathering’ point for the dissemination and comments on the state of Sri Lankan elephants. So on the second count; I think we have done pretty well. We are now in fact considering ways and means of keeping the blog alive, although the Raja project has drawn to a close. On the ground, we were able to talk to, and sensitize some 150 villagers in the area about elephants and the need to somehow prevent calamity befalling them. During the initial stages we were often met with good-humoured curiosity, as the ‘crazy city dwellers driving around in the hot sun looking for an elephant’. But as time went by, they appreciated our efforts and supported us, judging by the number of hotline calls we received of tusker sightings. Very few were hoaxes, though we had to sift through typical Sri Lankan over-enthusiasm (all in good faith of course), to sometimes arrive at the correct picture. If we had gone by all our ‘reports’ we would have recorded some 5-6 Rajas, and another 10 – 12 tuskers in the area, some with 6 foot long tusks!!! But there was no doubt that there have been at least two reasonably accurate sightings of what could be Raja, in the Rathanagama/Hambegamuwa ( north-east) areas. But the issue was that they were old sightings (more than six weeks old at that time). No sightings have been reported of late. Our hotline will be kept open for a month or two more, just in case we hear of something. Even today we still have a few villagers who call us and inquire as to whether we have found Raja. So the ‘crazy city dwellers’ may have in some way helped some of these villagers to think of elephants in a different way. We spent two and a half months looking for a live elephant, but saw more dead elephants. To see these once gentle giants, lying spread-eagled and bloated, stiff in rigor mortis, with maggots crawling all over them, or burning slowly at a way side cremation, was heart wrenching. We also came into contact with the on-going protests against the newly proposed elephant corridor at Dahagala. Scientists and the DWLC believe that this corridor is essential to allow for the movement of elephants in the area, and the Supreme Court has ruled that the fence must be installed. But there is a well-organized protest campaign by certain local leaders, blocking the erecting of this fence. The grapevine has it that opening of this route for elephants will disrupt some of the nefarious activities that are being conducted in the area. In any other country this will be tantamount to contempt of court, but then…this is Sri Lanka. Our team beat a hasty retreat from the area, as we did not want to be embroiled in this controversy. 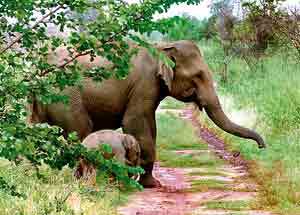 Today the UWNP has grown in popularity, both amongst Sri Lankans and tourists, and is without doubt, the easiest and most convenient location in Sri Lanka to view wild elephants all year around. During the time I was conducting my field study (2003) under the auspices of the US Fish& Wild Life Services at UWNP, I concluded that the park had a population of some 300 -350 elephants. 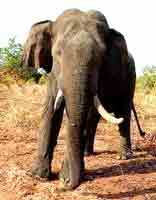 However emerging research ( Silva.S.& Ranjeeva.A 2007 ongoing) indicates that there could be up to 800 elephants in UWNP. Of course, a good proportion could be transient ‘visitors’ who use the northern “corridors” to move out of the Park periodically. Visitors are guaranteed of good sightings at any time of the year. In fact today, there many elephants who have learnt to solicit food from passers-by by staying at the electric fence along the Thanamalwila road. So one does not even have to go into the park to see elephants at Uda Walawe! I noticed this phenomenon in early 2000 when it was only‘ Rambo’ who frequented the fence, and wrote about it, warning of the possible dangers of this activity. Today, Rambo is still there, but he has a host of other companions, sometimes numbering up to twenty! The park boasted of four adult tuskers- Raja, Sumedha, Asoka and the Kalthota tusker, all non-resident. Of this foursome, Asoka met with a very suspicious death with gunshot injuries inside the park a few years ago. With the Kalthota tusker’s visits becoming infrequent, it was thus only Raja and Sumedha dominating the park. Up until last year when Raja went missing, Sumedha’s movements were limited, as he always played second fiddle to Raja, although he is also a well-built mature tusker. It may be my imagination, but of late Sumedha has been seen quite frequently in the park. Like Raja he visits the park when he is in musth. Now clearly in post-musth, he is still around in the park. Could it be that he senses Raja’s absence, and feels more confident that he is the new King of UWNP? UWNP has a reasonably well balanced healthy population of elephants. The park does not have any major problems due to encroachment or poaching. If adequate and careful park management and habitat improvement is undertaken, then, while we see the gradual demise of the wild elephants in other parts of the country due to the serious human elephant conflict, UWNP could be Sri Lanka’s future ‘last bastion’ of the Sri Lanka elephant. This was epitomized by a unique and most wonderful sighting at UWNP just a few days ago, as a mother emerged from the bushes with her newly born calf( less than two weeks old) to calmly walk across the road in front of us, with complete trust. A truly memorable moment, to be cherished for a long time. At the end of the day, the ‘bottom line’ is that we did not find Walawe Raja. We are not sure what fate has befallen him. But I am happy that despite the constraints, we ‘got out of our armchairs,’ and tried. Was all the effort worth it, for one single elephant? Yes….an emphatic Yes! Raja is an icon, a flagship. By focussing attention on him, I think we have been able to generate interest and understanding about the plight that has befallen Sri Lankan elephants. I still hope and pray, that one day, as I drive around in the UWNP, and turn a corner, that I will be greeted by the once familiar lumbering shape of Raja, as he nonchalantly walks up to my vehicle, as he has done many times before. Extreme weather: Are we prepared? Are we living in a false golden age?